Dr. David Thompson and his students in 1871. PHS volunteer Sue Althouse is currently processing the David D. Thompson family papers. Sue, a retired missionary who served in Japan, draws on her field experience and knowledge of the Japanese language to arrange and describe the correspondence, diaries, sermons, and photographs of Rev. 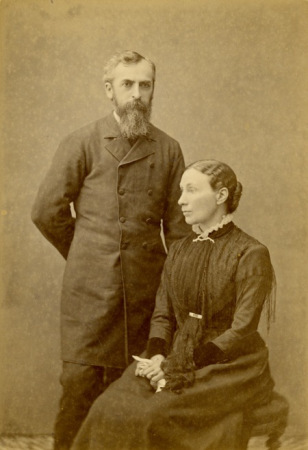 Thompson, one of the earliest Presbyterian missionaries in Japan, and his wife, Mary Parke Thompson. David Thompson was born September 21, 1835 in Harrison County, Ohio. He graduated from Franklin College (New Athens, Ohio) in 1859 and from Western Theological Seminary (Pittsburgh, Pa.) in 1862. The Board of Foreign Missions of the PCUSA appointed him to serve in Japan in 1862, and he remained in the field until his death in 1915. When Rev. 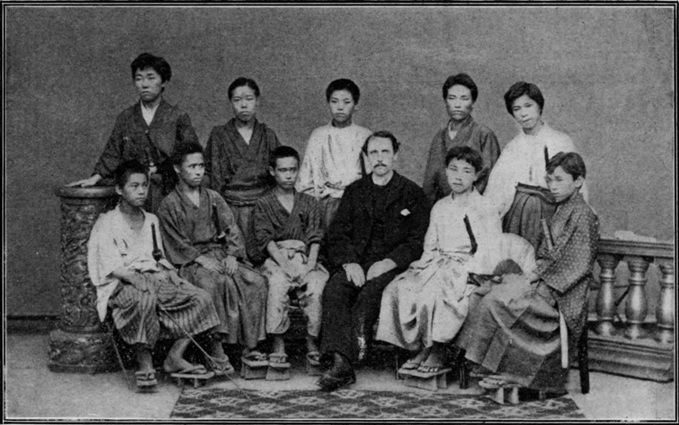 Thompson arrived in Japan in May 1863, Christianity was outlawed in the country. Sue reports that one of the most interesting aspects of the papers is the documentation of the world tour Thompson led in 1871 and 1872. The Japanese government sponsored the tour, which included representatives from every clan in Japan. In the United States and Europe, the delegation was constantly questioned about the persecution of Christians in Japan. Thompson’s tour was followed by the more famous “Iwakura Mission” of 1872-1873, led by Japanese ambassador Iwakura Tomomi. Both tours took place during the time when the Meiji government decided to allow the legal existence of Christian churches and the freedom to practice Christianity in Japan. Throughout his career, Rev. Thompson was a strong advocate for the unification of Protestant denominations in Japan. At one point, he severed relations with the PCUSA Board of Foreign Missions over the issue. However, the Board came to support the idea of a union church, and Thompson was one of the organizers of the United Church of Christ in Japan, a union of all Presbyterian and Reformed bodies in the country that first met as a council in 1876. David D. Thompson and Mary Calhoun Thompson in Japan. David Thompson married fellow missionary Mary Calhoun Parke in 1874. Mary, born April 17, 1841 in Ednahannon, Ireland, grew up in Ashland County, Ohio, and graduated from Xenia Female Seminary in 1866. After several years as a school teacher, she applied to the Board of Foreign Missions in 1872 and was posted to Japan where she met David. They married in 1874 and together had three daughters. Mary remained in Japan after her husband's death in 1915 and died in Tokyo in 1927. The collection includes Mary’s journals, which span most of her adult life, 1865 to 1924, and comment on her work as an educator, evangelist, wife, and mother. Particularly moving, according to Sue, is the account of her daughter’s death from a “fever” at age nine in 1887.